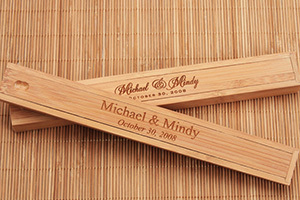 Engraved Personalized Chopstick Boxes - These custom chopsticks cases are a unique way to add a special touch to your gift of chopsticks to your favorite chopsticks lover. Beautiful yet elegantly simple chopsticks boxes with your engraved design in the box lid. Choose from a wide assortment of free fonts, kanji and graphics to make your custom chopsticks box uniquely yours.